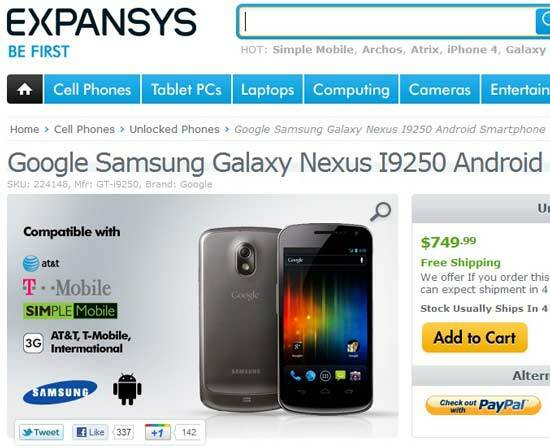 While US citizens are waiting for Verizon branded Samsung Galaxy Nexus (Or Nexus Prime) an online retailer, Expansys is offering the only Android 4.0 Ice Cream Sandwich phone in US without any lock or contract. Their GSM phone will work on AT&T and T-Mobile network in US and any international GSM network outside. Price of the carrier unlocked Galaxy Nexus in US is $749.99 now. It is in there stock now and it will take 4 days to deliver. This is the 16GB version of Galaxy Nexus. If you are interested to buy this instead of waiting for Samsung Galaxy S III, then go to Expansys online store now. Because it is the best Android phone for this holiday season. Or you can wait for Verizon offer.